Finally, I’m getting the knack of trekking. If you can hike through the most difficult terrains, there are rewards way beyond your everyday tourist occurrences or noisy television screens. You also realize if you quit worrying about it, your body won’t let you down. Half the problem is fearing you can’t do it. But you can if you forgetabout it. I didn’t even have to take an Ibuprofen. I w as so grateful to be outside. You are outside except for shelter to sleep in. For this homes and hostels are minor, with doors that open straight onto the streets and with no living or entertaining room or bathroom for that matter. Life is about labor and survival, but in a refreshing and religious way. Saturday’s storm cleaned the air of constant haze and smoke, but when the dogs began to bark and the roosters crow, the first movement in homes is to light a fire, and the smokey smell returns. After a pancake breakfast sitting on a balcony sending blogs and emails and watching the sun rise over the Annapurna Range, one mountain at a time turning pink on its pe ak, we set off about 7:30 for a far away destination, Landruk. First we had to make up for what we didn’t finish yesterday because of the rain. I’m piled in layers of shirts, jackets and scarves looking like a mountain myself. It’s cold at this hour. By afternoon I’ll be down to a t-shirt. The path was fairly reasonable in the beginning as we passed through a couple of hamlets or pueblos composed of about four to five structures, usually claiming to be restaurants and six r oom lodges with names like Heavenly Hotel and then crude brick homes of the locals. In most cases there is no electricity nor running water except from a barrel of caught rain water with a small tube for the water to run out so you can wash your hands, or as one of our porters did, wash his whole body with clothes on. There are no gas stations (no vehicles), no fast food places, no supermarkets, no furniture stores, no entertainment centers, just simple farmers providing a night’s stay to trekkers while others go about the harvesting of wheat, the herding of a handful of water buffalo, and loading products from one spot to another. Every load is transported by a porter using a strap around his head to tote the item, be it a table, a basket of chairs, or produce. 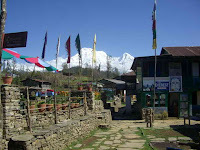 Women, in their lively colored wraps and skirts, will use their silk scarf maybe to wrap a sleeping child to their backs, or to carry produce home from the tiny food house which doubles as a kitchen to feed the trekkers. Children abound playing with whatever they find in the outdoors. Chickens range where humans are and share the picnic table benches with you. It’s amazing how people can still survive in far away locations hanging of off the forested skirts of giant mountains and deep valleys whose beauty has yet to be tarnished by modern methods of industry cityhood. And they laugh and dance and sing. They are happy. Their desires are family based. In each hamlet there is usually a small table offering Snickers bars, Cadbury chocolate, Potato Chips, banana gum, and a bag of cut up dried fruits or nuts. Mind you there are only two or three of each one. Children hang around these tables, picking up a candy or touching a gum, hoping to become the owner of one. A plastic bucket filled with water half way is filled with bottles of coke, sprite and Himala yan beer. 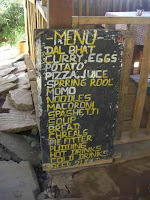 These are quick sales to trekkers always needing energy and to sit in the shade a while. For four and a half hours with only two stops for a Sprite or cup of tea, we covered every kind of up and down but the road, if you could call it that, was only one for feet, the inevitable stones over which we tread. Must be the world of Tolkeino and Hobbits. Today we met with the down steps. For all we came up yesterday, we went down today, and add to that more ups and more downs, but somehow I was more comfortable b ecause it wasn’t so violent as the first day’s continual climb. When we stop for lunch, it takes a while. 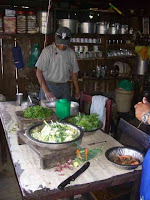 Jeta arranges with the family to prepare our meal, whatever we want. The father goes into the garden to pick fresh vegies, including cauliflower, finger sized carrots and assorted greens. Everything is finely chopped on the kitchen table. Jeta makes the dough for "momo" or pockstickers and fills them with fresh vegies for me; Jim usually has Dahl Bak, the Nepali hamburger, I guess. After lunch we began a severe trek down rock stairs, hundreds of stairs that seemed endless but took us through forests of orchids, moss and rhododendron trees not yet in bloom. Far away in the valley, our clear day was to be usurped again by a rain storm. 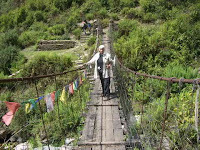 We walked quickly, climbing up and down the steps, crossing two wobbly suspension bridges (talk about hard to get your balance) that got us across a river, and passing many trekkers and many hamlets busy harvesting crops. 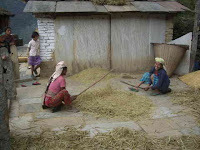 At one home, two women with long bamboo sticks were beating barley and wheat trying to get their work done before a storm arrived. We were dashing through trying to get to Landruk before the torrents of rain would fall. Jim asked if I needed a rest, I said No, let’s get to Landruk. And so we pushed on as quickly and safely as our legs would carry us. There was a nice relatively flat area through the farming tiers but when Landruk was in sight, the rains fell, not only the rain but hail. Jim and I jumped into a s torage shelter - normally for animals and crops about the size of a bus stop. We pulled our rain gear from the backpack (you always carry rain gear), and waited out the worst part of the rain before we got back on the path, rushing on the stone pathways to our destination. It rained and rained but we found a two story lodge which was quickly filling up and after some negotiation, done by Jeta, I got the room with a toilet attached. All I could do was fall in bed exhausted, wet and cold. I snuggled under a sleeping bag and a heavy blanket and was thankful my body hadn’t let me down. We had trekked a total of eight hours. 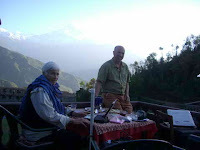 Ni ght came darkly and I joined the buzzing group for a quick meal in the dining room, where other trekkers and their guides planned the next days excursions. Jeta prepared my meal, so I ate and ran, so to speak, then lay in bed to tired to write but listened to the villagers dancing and singing out the night, thinking how lucky are these Nepali countryfolk. Photos: :Typical menu for all meals; Early morning work in front of Annapurna; a typical hamlet; a beautiful child; the swinging bridge; fresh vegies for lunch; women beating grain; Landruk.